Someone suggested that we leave the chores and go have fun with them. My sister got on the cart with my stepbrother and he guided the cart down the hill. When it was my turn I decided I did not need to have anyone ride with me. I climbed on the cart and it started wobbling. As it gained momentum I realized that I had neither knowledge nor experience on how to steer or stop the contraption. I panicked, feeling certain if I kept going I would go over the cliff and just as certain that even if it killed me mommy would still give me a beating for having disobeyed. I jumped off the cart while it still moving and wounded my knee. I was able to hide the incident from my mom only until the next morning, I was in so much pain I could not walk. I still have a scar on my left knee that reminds me of that day. I had been drawn away from my study of the book of Acts by this memory. The Wesleyan Bible Commentary on the book of Acts states, “There is no substitute for obedience, and there is no spiritual Pentecost, (and to my understanding, no power,) without obedience. If God’s power working through us is in fact intertwined with us obeying His teaching, then is it not time for obedience? D.L.Moody is quoted to have said, “You might as well try to see without eyes, hear without ears or breathe without lungs as to live the Christian life without the Holy Spirit. “Gift of Jehovah,” that’s what his name means. I sat at my desk on Tuesday morning, working, but the tears would not stop. He was dead. For several days my mind offered up a single cry, “Father, I don’t understand…” I had really admired this 19-year-old who was so responsibly and committed to his faith and his work in the church. I tried searching the internet for news about the accident — it’s sometimes hard for me to process things without facts. I did not find anything about him but there were so many others who had died during that week and I found myself grieving for them and their families as well. I was reminded of Matthew’s re-commitment to God on Sunday, he had held his hand up high when Pastor Garmon had asked if anyone wanted to renew their commitment to Christ, and I sat next to him as he reaffirmed that commitment out loud. I realize that if I believe “The Book” then Matthew’s life, no matter how much we miss him, is not lost. Paul said while we live we have the opportunity to glorify Christ and bring benefit to others, but when we die, if we know The Christ, we gain. Matthew’s death reminds me that we have no guarantee of the length of the days of our loved ones –they can be taken in the next second, minute, hour, day; So I ask again, is it not time for courage? In Acts 4:13 the Bible tells us that as Peter and John boldly proclaimed that there is only one way to God — that is through Jesus Christ — that those who opposed the message were astonished at their courage. Courage to speak the truth of The Word even though it could cost them their lives. My prayer is that God would give us the courage to live and speak the Good News of the Gospel with clarity, conviction and boldness. Courage to work through those things in the body of Christ that divide us and cause others to question the validity of The Faith. Courage to decide to do life according to the Word so that we don’t cause others to stumble. Courage to reach and love those in our space back to a relationship with Christ. Courage to reach our world. It was night-time and I wondered if he still hoped that tomorrow would be different. Was it really possible for him to remain hopeful for 20, 30, 40 years? I couldn’t imagine being in his state — for he awoke every morning, seemingly powerless — having to be carried from place to place, bathed, fed, clothed, then taken to perform his daily work. He was a beggar. He enjoyed sitting outside though, for here, surrounded by beauty, he had dreams that his life would be different. He was pulled from his day dreaming by the bustle around him. He realized that it must be almost 3pm – prayer time, it was like clockwork. Some passed by as though they did not hear, some in a rush to get inside to pray did not even notice him there, but every now and again he would hear the tingle of coins as they fell into his can. He tried not to become discouraged, but he had hoped that something miraculous would happen here, at the gate called Beautiful. He’d heard about the Nazarene and his power to heal, but he had never met Him. He’d heard that His disciples came to the temple to pray and wondered if they could do the same miraculous things that He had done. “Anything for the poor and cripple, Anything…?” His mind was far away, he had said those words so many times he did not need to think about them. He was surprised when he saw two pair of legs stop in front of him, “Look at us!” one of them commanded. He looked into their eyes, afraid to find the familiar look of disgust, but instead he saw compassion. So they had been with the Christ! he thought. He felt his ankles becoming strong as the man reached out his hand and pulled him to his feet. As he leaped and jumped around like a child he raised his voice in praise. He was healed! “Pentecost happened,” Peter said. “An empowering by the Holy Spirit has taken place, an enabling to DO, to impart God’s power to affect change in the lives of others. God’s power has been given. 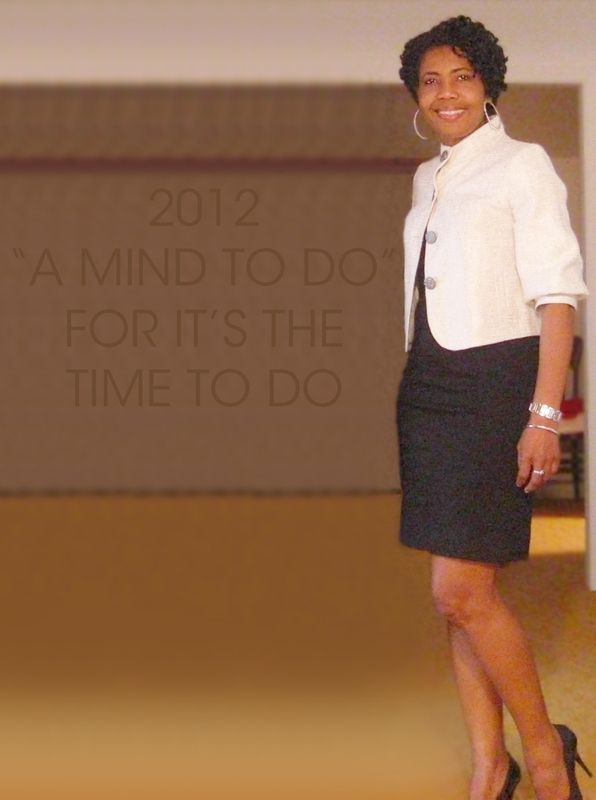 If you feel crippled or powerless by the tough challenges of life, it is 2012 the time for healing, time to arise and do. As I sat and sucked on the bottom of my fifth ice cream cone I once again discounted the wisdom that when we know better we do better. A few days earlier, in a hurry to get to some location that does not seem that important now, I had found myself divorcing the wisdom of safety — I had closed one eye, peeked at the yellow light ahead with the other, and to my horror, had accelerated. For many days in 2011 I had groaned when my clock alarmed at 4:45am, and instead of jumping out of bed to stick to my fitness routine, I had pulled my cover closer, curled around my teddy bear, promising myself, I’ll exercise tomorrow. When my clock alarmed again at 6am signaling my prayer time I had sometimes crawled out of bed to pray, but mostly, I had either slept right through it or sent up some mental prayers while I was still curled in bed. Give us a mind to act on the good we know, a mind to use the knowledge we’ve already acquired, a mind to live the wisdom we’ve already attained, give us a mind to live out the love we so fluently speak of — give us a mind to do, for it’s the time to do. I believe when we know better we become equipped to do better, but a life of living the better we know must move beyond the acquisition of knowledge. We need “a mind to do” — where there is a marriage of knowledge, wisdom and discipline, a marriage of truth, love and kindness, a turning from selfish agendas to the serving of others — a mind that enables us to live more eloquently than we can ever speak.